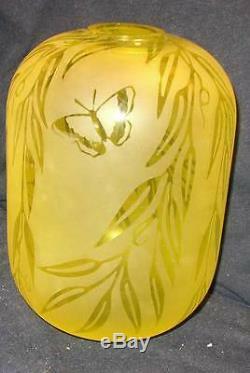 Yellow glass, with an etched design of willow leaves and butterflies, and thus a kind of echo or reference to the butterflies often seen on English (Webb) cameo pieces. Not true cameo on this piece, I suppose, because there is only one glass layer, but still a fine and unique Kelsey/Pilgrim piece. The staining she refers to may be a mild iridescence on the surface. 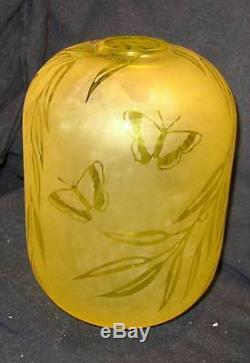 The item "Nice Kelsey Murphy Pilgrim 7 1/2 yellow etched cameo glass vase-unique" is in sale since Wednesday, September 7, 2016. 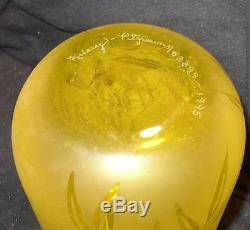 This item is in the category "Pottery & Glass\Glass\Art Glass\North American\Pilgrim". 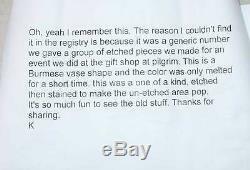 The seller is "drrosie" and is located in Morgantown, West Virginia.